The cold storm that brought rain and snow to the area yesterday is moving eastward. There will be a few light showers this morning but they will end by afternoon. 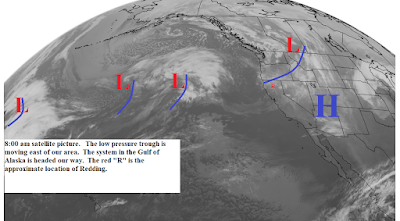 Partly cloudy Tuesday and then the low pressure area that is is currently in the Gulf of Alaska (see satellite picture below), arrives Wednesday. This system will bring moderate rain to the area Wednesday with snow levels 2500 to 3000 fee north and slightly higher south. Thursday the north state will see showers with snow levels 1500 to 2000 feet north and 3000 feet south. A weak high pressure ridge will be along the coast Friday. Skies will be partly cloudy to partly sunny with temperatures remaining below normal. Saturday a weak low pressure trough will brush the north end of the state (see map below). This system will bring light precipitation to the foothills and mountains with a chance of showers in the north end of the valley. Snow levels will be 4000 to 5000 feet. Another weak front will move through late Monday.